Having more than proved its worth with the initial Road To Ultra event in 2015, the world’s premier, award winning and most successful independent music festival brand is expanding its presence in Singapore in September 2016, to a full scale two-day festival experience. 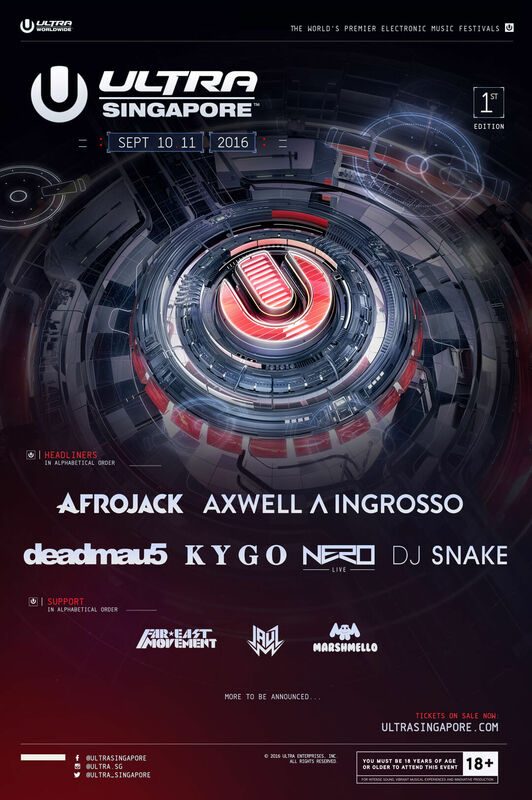 The upgraded event is stacked with Phase One headliners Afrojack, Axwell^Ingrosso, deadmau5, Kygo, DJ Snake and Nero Live, and will form the THIRD major ULTRA festival in Asia alongside ULTRA Korea, which wrapped its 5th year in June 2016, and the upcoming third edition of ULTRA Japan, also in September. Canadian luminary deadmau5, who is currently mid way through his ULTRA Worldwide 2016 global tour, will have completed a colossal five ULTRA dates this year after his appearance in Singapore. The mau5 sent fans into a frenzy in March this year, throwing down a staggering three unique sets at Ultra Music Festival in Miami. Kygo – the crowned king of a billion Spotify streams – will make his debut at ULTRA Singapore on his very own birthday weekend, bringing his unique and versatile style to the main stage. Scandinavian stalwarts Axwell^Ingrosso will fly the flag for Sweden, British three-piece live electronic band NERO will rep the UK, while everyone’s favorite producer DJ Snake does the same for France. Ticketholders can expect nothing but colossal performances from these main stage masterminds, as the combination of top-notch talent with ULTRA’s unmatched festival production will render fans breathless. Completing the Phase One lineup, the mysterious masked producer / DJ Marshmello, and Bass House pioneer, JAUZ. This array of top-notch talent will be performing at the stunning new ULTRA Park venue across the weekend, set on Singapore’s very own ‘Bayfront Avenue’. A spitting image of Miami’s Bayfront Park location, and situated right across the Marina Bay Sands Hotel, ULTRA Singapore will be the first event of its kind held at this sensational outdoor venue. The gorgeous new space will not only provide spectacular views of the downtown skyline, but also impeccable vistas of the world famous Marina Bay. Drawing further parallels to Miami, ULTRA Singapore will receive the full treatment, bringing festivalgoers the inimitable MAIN STAGE, ULTRA’s Live Stage, and of course the RESISTANCE concept featuring techno, deep house and the darker side of dance music, whose popularity is a juggernaut in itself. This weekend is set to capture the minds and imagination of the nation, as ULTRA delivers its critically acclaimed experience. ULTRA Singapore marks the start of ULTRA Worldwide’s second Asia run this year, with the highly successful ULTRA Korea festival and the sold out Road To Ultra Thailand event having already taken place in June. Part two will see the brand undertake six stops including Singapore, Taiwan, Japan, Hong Kong, Bali and the Philippines all within a two-week span – a festival first and a feat no other event organizer can lay claim to. In addition, the ULTRA brands pioneered the live stream experience, ‘ULTRA LIVE’ (whereby the festival is brought online to over 20 million unique viewers globally) and the audio broadcasting platform ‘UMF RADIO’ (syndicated to FM Radio in over 62 countries and reaching more than 22 million listeners weekly). Also UMF FILMS’ collaboration with FINAL KID has seen some of the most visually breathtaking festival aftermovies in the music space, including a feature-length documentary exploring the explosion of dance music, entitled CAN U FEEL IT, which premiered at the Ultra Music Festival, Miami 2012 and was exhibited in over 500 theaters across the Unites States.